Meg Software – We build great iOS and MacOS Apps. If you own a Peloton Bike, Tread or you use Peloton Digital on your own equipment, you need this App! A great app and absolute must-have for any serious Peloton owner. The developer has done an amazing job providing advanced functionality in spite of a lack of HealthKit integration or a comprehensive API from Peloton. Brilliant application of Peloton user data, great presentation and reporting functionality. As a Peloton user – I love this app! The app is catered for heart rate or power zone training with the Apple Watch and iPhone. It synchronizes automatically with the Peloton cloud and produces useful ride and summary graphs. I really like the way the app takes the Peloton rider’s perspective from so many different directions, including displaying the later power zones from the latest FTP test right on the iPhone screen while displaying the real time heart rate data. Great work! Wife and I are Peloton cycle addicts and as much as we love our bike, they simply refuse to offer Apple integration to iPhone or Apple Watch. The developer is also a Peloton rider and created this insightful and visually stunning app which displays all your success and metrics in a well-designed iPhone app. Fully downloads all your stats from Peloton including instructors, cadence, HR, resistance etc. If you have a Peloton, you need this app! It’s a great way to track and compare your progress over time. It also allows you to easily participate in instructors challenges. Personally I’m a huge proponent of power zone training and couldn’t do it without mPaceLine – love being able to quickly see my progress! As a Peloton addict, I highly recommend this app. Like a dashboard for your training, combine your ride data with other metrics like weight and measurements to chart your progress. Filter and sort your data to see trends like your fav instructor, participation in power zone training challenges. Now includes TSS (total stress score) as well. App developer is really in tune with the community. Such a great Peloton add-on!! For those Peloton riders in the Apple ecosystem using Power Zone training on their bike, this app is fantastic!! I love the graphics and seamless way it works with our PZ Facebook group. A great value for the money!! If you like to track your workouts and progress, this app is a must have. If I could rate it 6 stars, I would. This app is the perfect compliment to Peloton riding. It provides enhanced metrics, ride comparisons, performance charts, etc. everything needed to track performance and improvement over time. If you like data, and you ride a Peloton, this is a must buy. This app is really amazing. It is easy to use, provides incredible detail, has so many features can’t name them all. The training programs are always current and makes following the schedules a piece of cake. Makes the Peloton experience even better. Most useful for those who do power or heart rate based training, but contains great features for all Peloton riders. Easy access to history of what types of rides you ride, how your output has changed over time, and lots of other metrics. And at a one-time purchase rather than a subscription, a steal. mPaceline is a cycling and running workout App designed to help you visualize your results over time. The App works best if your focus is on taking spinning or running classes that provide metrics on your class performance. It’s primarily focused on individuals that own a Peloton Bike, Tread or a 3rd party equipment owners that utilize the Peloton App. However, if you have Power or Cadence meters on an outdoor bike, mPaceline will work equally well. See live Heart Rate and Power metrics as you ride. mPaceline can connect to a number of Bluetooth Peripherals to show you live data. The power of mPaceline is that it helps you demonstrate that your ride performance is improving. View a number of charts and graphs to show that you are getting stronger. mPaceline is a great Peloton Companion! 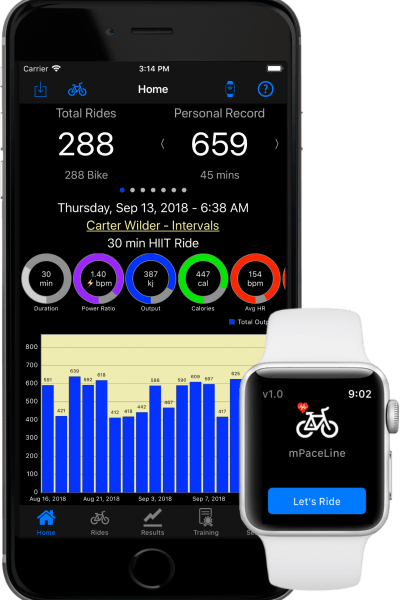 When your ride is complete, mPaceline will pull additional stats and data from Peloton to give you a complete picture of your ride performance. Quickly see your most recent ride and summary performances across all of your rides. Summary stats show your progress - swipe top bar for more visuals. See details for each ride you have taken. View your Heart Rate, Output, Cadence and Resistance on graphs. If you have your FTP set, see your output overlaid on you Power Zones. See a number of key metrics charted across all of your rides. You can easily see improvements from your training. Compare your performance with other riders in the community. View a number of ride metrics to see where you stand. Our users agree that mPaceline can be a great compliment to your Peloton Training. It is a huge motivator and can demonstrate with a few graphs that your ride performance is improving. Not matter your training style, cycling ability or age, mPaceline can help you. Built in support for both Heart Rate and Power Zone Training. No matter your training style, mPaceline has you covered with real time stats and post ride analysis. mPaceline Settings allow you to setup the App based on your preferences. Setup your HR and Power Zones, build your user profile and connect to Peloton to download your ride data. We are not just the developers, we are members of the Peloton Community. We built mPaceline to track our own rides and demonstrate improvements. Let us know what you think. mPaceline is easy to use and visually appealing. You'll be up and running quickly. It's packed with help throughout the app. Email if you have any questions. mPaceline has a companion Apple Watch App. Install it on your watch to track and monitor rides real time. Curious about how you compare to a ride that you just repeated. Use the compare ride feature to overlay the output graphs from multiple rides on a single chart. Want to get credit for a ride in Apple's Activity App. mPaceline will create workouts for your when your ride is complete. Are closing your Activity Rings important? mPaceline can handle this as well. If you are new to mPaceline or are just interested in how it works, please take some time to review the training and frequently asked questions that we have put together. You may glean some good insights on the best ways to setup and utilize mPaceline. We have written a extensive getting started guide for mPaceline. Click to download. Download on the iOS App Store. Only purchase if you are pleased.